Michael Chorost became a cyborg on October 1, 2001, the day his new ear was booted up. Born hard of hearing in 1964, he went completely deaf in his thirties. 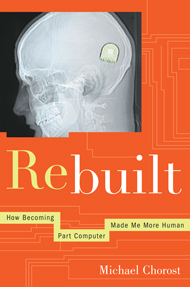 Rather than live in silence, he chose to have a computer surgically embedded in his skull to artificially restore his hearing. 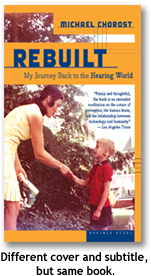 This début book is the story of Chorost’s journey – from deafness to hearing, from human to cyborg –and how it transformed him. The melding of silicon and flesh has long been the stuff of science fiction. But as Chorost reveals in this witty, poignant, and illuminating memoir, fantasy is now giving way to reality. Chorost found his new body mystifyingly mechanical: Kitchen magnets stuck to his head. He could plug himself directly into a CD player. His hearing was routinely upgraded with new software. All of which forced him to confront complex questions about humans in the machine age: When the senses become programmable, can we trust what they tell us about the world? Will cochlear implants destroy the signing deaf community? And above all, are cyborgs still human? A brilliant dispatch from the technological frontier, Rebuilt is also an ode to sound. Whether Chorost is adjusting his software in a desperate attempt to make the world sound “right” again, exploring the neurobiology of the ear, or reflecting on the simple pleasure of his mother’s voice, he invites us to think about what we hear — and how we experience the world — in an altogether new way. Brimming with insight and written with dry, self-deprecating humor, this quirky coming-of-age story unveils – in a way no other book has – the magnificent possibilities of a new technological era.